Camas Cove is a quaint boutique winery nestled on an ancient volcanic sand dune next to Moses Lake. Wine lovers turned vintners; Nancy and Dennis Parr began their winemaking journey in 2004. As long time wine enthusiasts, they hope to produce quality Bordeaux-style wines at an affordable cost. They want their unique vintages to be worthy of being lovingly aged and enjoyed for years to come. No strangers to fun agricultural challenges, the couple grew mammoth pumpkins for competition in 2001. Their largest pumpkin weighed in at 780 pounds! They then held a well-attended and lighthearted pirate-themed Pumpkin Regatta on the lake that year. Guests had to move the impressive hollowed out pumpkins across the water. Their first attempted plantings of wine grapes included Chardonnay, Roussanne, Counoise and Syrah. They use drip-irrigation to carefully water the vines. In addition to these varieties, they also source grapes from other local vineyards. Their first harvest occurred in the fall of 2008. Their ingeniously converted barn houses the wine making process, overseen by Cameron Fries of White Heron Cellars. The charming barn turned tasting room is inviting to visitors. Boating lovers can dock right next to the winery at their private pier. Guests enjoy a gorgeous view of the lake from the outdoor patio. The winery and tasting room opened in 2011 and can be visited on weekend afternoons from 1-5pm. They also frequently pour at the Moses Lake Museum and Art Center. 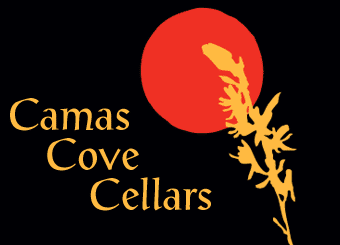 Camas Cove produces several reds; including a Cabernet Sauvignon blend, Merlot, Syrah, “Pirate Red”, and a dry Rosé blend. They offer silver and bronze medal-winning whites, their 2012 Reserve Roussanne and their follower favorite “Thelma and Louise” blend. The later cleverly named in dedication of their mothers. They offer a wine club for fans of the winery. Members can select 6 bottles of wine per year at a 15% discount. Members also receive a 10% discount at the winery gift shop and invitations to member only events and gatherings. Their wine can also be found at several establishments in Moses Lake, Washington. Their small-batch vintages run about $16 per bottle, making it a very affordable option for boutique winery lovers. Lucky visitors will get to experience the knowledge, passion, and hospitality of this small family-run winery. They offer free wine tastings and a cute gift shop on-site. The Columbia Basin area receives little annual rainfall. Therefore, visitors to this waterside winery will likely find their experience sunny and relaxing.